I’ve just been up to The Guardian to take part in the Carnival special on the Music Weekly Podcast. I did the same thing last year, with Dan Hancox, but this was different for obvious reasons, not least because at the time of recording we didn’t know if Carnival would even be happening. Carnival will go ahead. The organisers have released a statement saying they are not contemplating cancellation, and The Met haven’t asked for it. The press release includes a statement from The Met saying that they “continue to work in close liason with Notting Hill Carnival ltd and the other partner agencies… our plans will be under constant review and this will continue right up to and during the event itself. The MPS have currently made no recommendations to cancel Notting Hill Carnival and we will continue to plan for the event.” There are lots of discussions for the organisers and police to have about creative, sensible responses to the civil unrest, and plenty to do before bank holiday weekend, but Carnival will go on. This is fantastic decision from both the police and the organisers. Why? 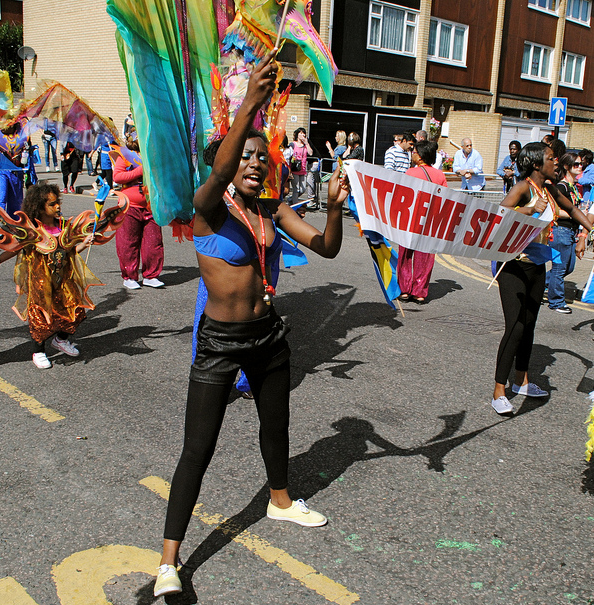 Because Carnival is a positive, energetic, powerful way for people to reclaim London’s streets for dancing and socialising, not for rioting and looting. Dancing in the streets to ragga or drum ‘n’ bass or soca isn’t for everyone, but neither is Glastonbury, or the London Marathon, or Glyndebourne. London is many different things, but London is a street city. A city of urban culture. A city that has benefited economically, culturally, globally, from our powerful street culture and the creative industries that have spun out of our strong, funny, clever, future-facing inner city culture. I was talking to Guardian writer Kieran Yates, who was also on the Carnival podcast with me. She made a good point. 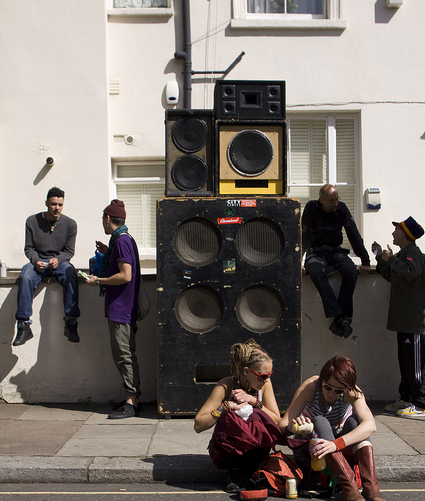 The heart of carnival isn’t the soundsystems, it’s the Mas Parade. There are children who’ve spent the whole year sewing feathers on to head-dresses and groups who’ve worked incredibly hard, doing brilliant social work in the true sense of the word, to bring families and friends and communities together to create costumes and parades. The steel pan players and the samba bands are rehearsed and ready, and the small businesses that provide food, whistles and drinks for revellers have stocked up. We can’t collectively punish people for the madness that descended on the country this week. We shouldn’t deny people the chance to celebrate London and to boost their businesses or their self-esteem. There is a dangerous assumption at the moment that the people who go to carnival are the people who were rioting and looting. Carnival is for anyone who likes to hear loud music in the open air, who wants to connect with like-minded people and who wants to celebrate the immeasurable benefit Caribbean culture has added to English culture over the last half decade. It’s also worth noting that the event wasn’t cancelled in 1981, or after the bombs in 2005 and hasn’t been cancelled since it started in 1964. The madness has abated, the problems remain, but we need to rebuilt and avoid giving in to fear and scaremongering. We need to be strong, and work hard to make Carnival work. There’s another dangerous assumption in the air: that this week’s chaos is entirely different to 1981. I have lost count of the number of sensible people who believe the line that the riots were entirely about looting trainers. They weren’t, not in essence. The people who got caught up in the contagious madness of Monday and Tuesday were part of a group insanity where they weren’t able to make good moral decisions – and they’re paying for it, heavily. Go inside a little further, and you’ll find a sector of society who have a very different experience of the police than people living in mainstream society. This experience, shocking and unpalatable as it seems, is overwhelmingly negative. I speak from a position of authority on this: I’ve been a mentor for five years at the very brilliant Live Magazine in Brixton, which is run by under 21 year olds, and this is what they have told me. The police face a huge challenge in terms of their interactions with London’s youth, and everyone needs to step up to address it. But that’s a bigger picture point. This morning, on the Music Weekly podcast, I was faced with a more pedestrian problem today. How, in the current climate, could I choose a big carnival tune to talk about on the podcast? A brilliant jungle reworking of an Africa Hi Tech track with the Ini Kamoze ‘out in the streets’ refrain didn’t seem sensible. Nor did the wildly brilliant Terror Danjah remix of 1985 dancehall dude Admiral Bailey which starts with a judge berating a defendant for being found guilty of disturbing the peace. I self-censored, which is a pity because they’re amazing tunes. We don’t expect art, or opera or ballet to shy away from strong emotions or from declarations of power and oppression, but somehow, today, things felt different. Now the disorder has abated, right-minded people are asking themselves: what can I do? Maybe there’s a way to bring that to Carnival. Go and talk to people. Smile at the screw-facing kids and the police and say hello to everyone. Kill any negativity with kindness and a little skank to some deep, conscious reggae at Aba Shanti or a massive jump-up at Metro Glory. Volunteer to help next year. The good people that organise Notting Hill understand the power of Carnival. We should too. It’s a bit late but here’s the link to the Guardian’s Music Weekly podcast from last week. Dan Hancox and I were guests for their carnival special (funny how long ago carnival seems as soon as you get into September). 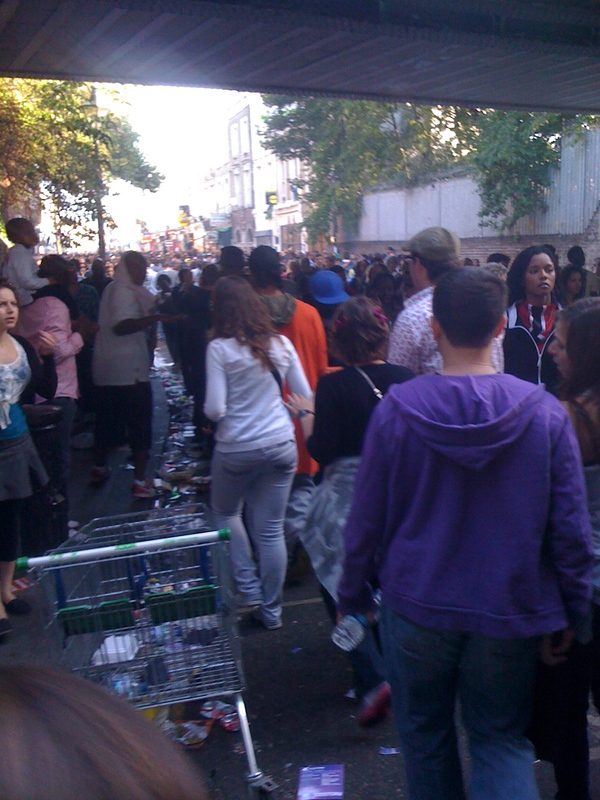 And yes, in reality Carnival does look like a riot.